This week we meet Owen, find a knife, people are shelved where they died not where they lived, about alterations, that Wesley carries a bo staff, that archive paper can be used to send messages both ways, the Histories are getting older and more numerous, that either Wesley or the Coronado are bringing Mac's parent’s back to life, and Ben is awakened. Oh, I forgot to mention the bo staff… so cool! Here are my thoughts in blue (@thebrainlair) and Maria's (Maria's Melange, @mselke01) in purple. Don't forget to head on over to Maria's Melange to see what she was thinking and my responses to her! Maria: Great selection of quotes! I’ll have to make some of these into images for the page. Mackenzie is this strange mix of teenager and adult. On the one hand she wants be “M”. Just a girl who hangs out with friends but she is so steeped in being a Keeper that she doesn't easily communicate with other teenagers. She takes life seriously and thinks it would be easier to just be alone. She wouldn't have to remember to lie and she could focus on her job. But, she recognizes that she is missing out. That having Wesley and Lyndsey in her life are “something good”. I wonder how she will deal with this now that she has Owen. Maria: While Mac’s life is extreme - I think it’s a good reflection of that awkward time in our lives when we are stuck ‘between lives’. I think that’s one of the reasons I identify with Mac in some ways. There are always the lies we tell our parents, the lies we tell our friends… I guess even as an adult, right? These two scenes with her parents also remind me that she is still a child. And no matter how old we are, we want to know our parents care. The scene with her mom illustrates how far apart they’ve grown. She wants her mom to know she is lying so they can talk but she doesn’t expect her to, really. The scene with her dad also illustrates their relationship. While she doesn’t think her mom will get it, she depends on her dad to be there for her. Even if she can’t tell him the truth, it’s somehow ok if he knows she’s lying. He must have always supported her in the past. Again, it makes me think he knows she’s a Keeper. Maria: I think the loss of her brother really made the rift between Mac and her mother bigger. It sounds like Mac’s thought her mom was a bit “wifty” for a while… her strange predilections and impulsive behavior sound like an established pattern that just got worse once Ben died. I wasn’t happy with her father in the first section of the book, but I think this chunk really helped show that there is strong relationship there. She WANTS their help… but she knows she can’t have it. Another big part of Mac’s journey to adulthood. Kathy: "Wifty", yes. We hope that her mom settles down with the coffee shop and they can start sharing again. They love each other. They just need to find their way back to each other. This conversation between Ms. Angelli and Mackenzie brings to mind an earlier conversation about memories and the purpose of Histories. In a way, it seems like Mackenzie is of two minds, that she doesn’t care about other people’s past, just her own but she also says that everything should be remembered. Does she just mean, each person’s family should be responsible for their memories? But what about your friends? Wouldn't you want to help them preserve their memories? Ms. Angelli is an antiquities collector because she wants to remember the past. It gives her a connection. But she also says that some things aren’t worth remembering. So, like Mackenzie, she is of two minds. They both want to select what should be remembered. Like we do, though it doesn’t always work. I sometimes remember painful experiences that I’d like to forget and sometimes forget the good things. But, can we really forget or do we just have a hard time accessing those memories? Maria: I think the theme of memory and history is so important to this story (I talked about it, too!) As a history minor in college, I have to say I think history is vital. When we lose our connection with the past, we lose so much. We lose our ability to learn from the patterns of success and failure. We lose our sense of being part of a bigger picture. We lose the idea of how far we have come - or how much farther we have left to go in issues of human rights and equality. When people ask me what superpower I would like to have, I often respond with “memory”. I want the ability to choose, though. To choose what to remember with crystal clarity and what to blur into just the shape of what has gone past. I hate the idea of losing my memories, and especially the idea of having someone ELSE choose what I can keep and what gets tossed. Kathy: I wish social studies classes focused more on the connections through history instead of just trying to memorize dates or judge the leaders of the past. It would be great if we thought more about what was happening in society that allowed each leader to "succeed" or led some to "failure". What had the people experienced or what were they hoping to experience? How does that relate to us now? Students would get so much more out of school, I think. This passage brings two things to mind; being so busy that your mind can’t rest and the silence reaching where “memories SHOULD be”. There are times I need to slow myself down and just be. I’m running myself ragged and need to get some downtime and some sleep. I know that relaxation and sleep are restorative but have also led myself to believe that I’m too busy. And when I want to relax, I can’t. So I crave this silence Mackenzie finds with Owen. This absence of not just noise but thoughts and this bearer of calm. This was why I chose the word preparation this year. Because the more prepared I am, the more time I have to step back and relax and reflect. What do you think of the statement “where memories should be.”Does Owen’s silence bury Mackenzie’s memories? Maria: That’s an interesting question. I know I’m often so busy that I can’t take the time to really reflect and store my memories. I feel like Owen’s gift of silence gives Mac the chance to rest, but I didn't get the sense that it would damage her memories in any way. Sometimes just the break from the constant barrage of noise and thoughts can help me regain the energy to deal with things. But maybe that’s just my introversion talking. Ha. Even though the first two things mean the same thing - lending and checking out - I find it funny and sometimes tease the students that I’m not there to help them, I’m too busy reading all the books! Maria: This also reminds me of one of my bigger questions about this world - what IS the point of the Archive? What role do the Librarians play? I get what Keepers and Crew do… as long as we accept that the Archive is needed. But what is the actual role of this library of memory? Kathy: I'm going to search for this - to see if it's answered in the next part. That's a great question. So we answered the question of who Owen is but not the question of why? How did he die and why isn't he slipping? I also wonder what happened to Robert. And who killed all the Coronado residents? Time to finish the book and, hopefully, get all my questions answered! 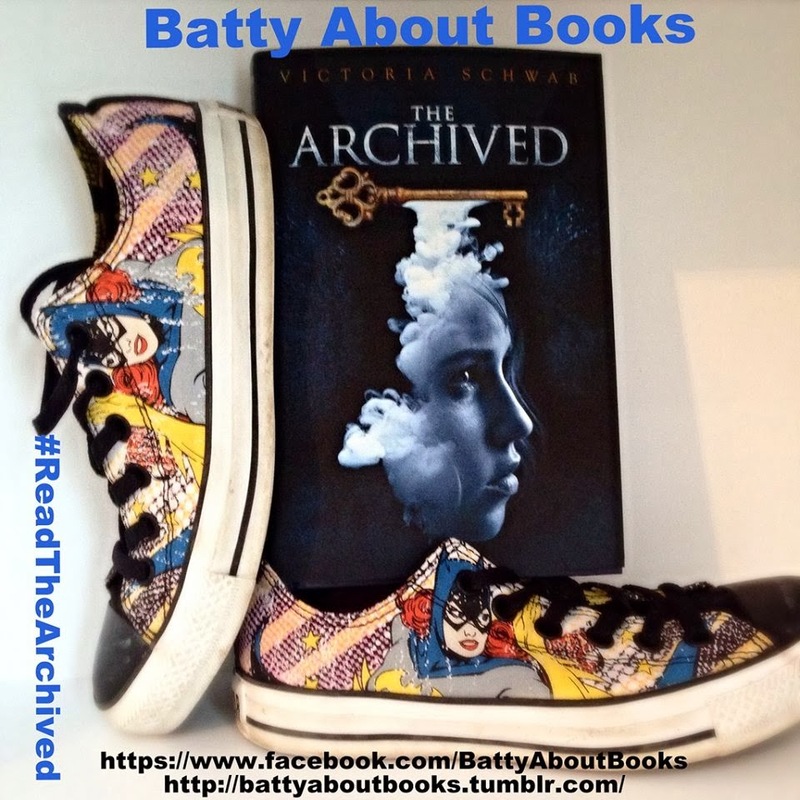 Check out our Batty About Books Facebook page where we will post quotes from the final pages of the book. Or at least Maria will! What are your thoughts so far?